When Life Safety and Business Continuity is Non-Negotiable. 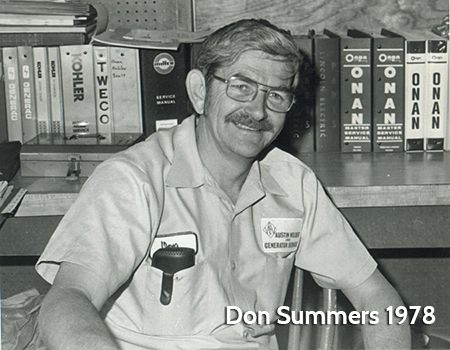 Don and Gwen Summers founded the business in March of 1978. Each of their four sons worked in the business in the early years. Kurt is the one son who remains in the business and is the current President and CEO. We are proud of the more than 35 years of service we have provided to our customers. Of course, no company can grow without strong leadership. Kurt believes that recruiting and retaining outstanding individuals at every level is the key to success and longevity. We have professional men and women who possess unique skills and abilities, each dedicated to building a successful company, dedicated to growing a dynamic Team, dedicated to serving our customers! In the beginning, the family business focused on a “Service Only” model, limiting new product sales. Today, without compromising quality services, we are now dedicated to providing all aspects of power generator products and solutions, providing to our customers customized solutions. And with our emphasis on the sale and installation of new power generator systems, including a Team of Licensed Electricians, we are the “One-Stop Shop” for all of your Emergency Standby Generator and LoadBank testing needs. Markets we serve today include commercial, technical, medical, financial, governmental, and residential customers. New markets include oil and gas, utilities, data centers, and some international markets. In the mid 1990’s, significant change came in the industry and the company shifted from service and selling smaller products to a new focus on large, emergency standby generator systems. This change enabled the company to improve profitability and resulted in a decision to discontinue service on all portable generators and welding equipment. While these decisions were difficult for Don and the family, they were necessary to advance the company forward. The same reputation for reliability and quality continues today, and many of the AGS standby customers have been patrons of the company for decades. In 1999, another significant event and opportunity came to the family. The owner of a national load bank rental company met with Don and Kurt to discuss the possibility of representing their company in Texas. And so began our load bank rental business. In addition to its core business providing generators, AGS grew its load bank rental business throughout the southwest United States until 2007. It was then that the national rental company changed their marketing strategy and the Summers family decided to form a new company. With significant investment in equipment and personnel, LoadBanks of America (LBOA) was born. This segment of the business generated a significant portion of the company’s revenues for nearly 10 years. In May of 2016, as LBOA was entering new phases of growth and competition with other national rental companies, Kurt made the decision to sell that portion of the company to one of those national competitors. 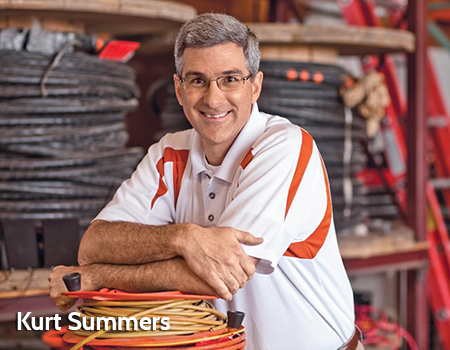 There were many factors that went into this decision, the most significant being that Kurt wanted to focus more on the core business of generator service and sales with AGS. In April of 2002, Don retired as President of the company and transfer of the ownership of the business to Kurt and his wife Cathy followed soon thereafter. Succession is always a critical event in the life of a business, especially a family owned business. The positive, loving relationship between Don, Kurt, and the family made the transfer a success for all. Today, as second-generation business owners, Kurt and Cathy are able to focus on growing the company and continuing the legacy of exceptional customer service. Austin Generator Service is a d.b.a. businesses of the founding company, Austin Welder and Generator Service, Inc., a Texas Corporation. AGS will continue to build a quality brand by providing reliable products and services nationwide. The overall value we provide through both companies is unique in the industry, with synergies to support most any customer requirement. A growing team of professionals coupled with a commitment to serving customer with excellence is a formula for success. Our faith in God, our commitment to the customer, and our hard work is what we believe results in a great company.